Slider Bar Café in Palo Alto recently opened on the popular main drag, University Street. There were countless restaurants bustling on a Friday night, including this place. 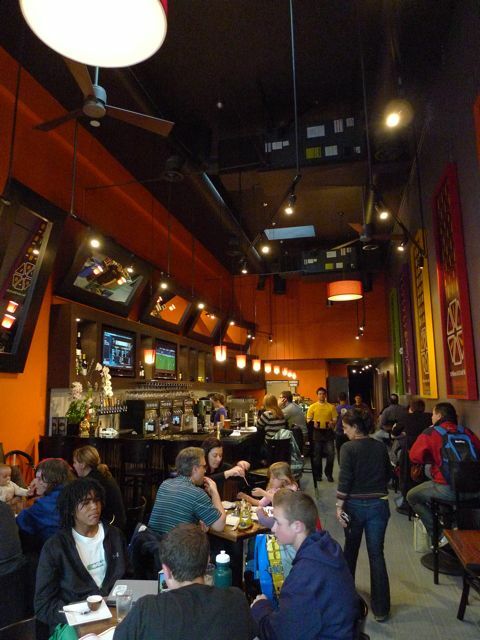 A striking, high ceilinged room welcomes folks to the café. We sat at the bar as all the tables were full. Slider Bar Café has a sophisticated take on the slider concept, also serving several micro brew type beers and mid-level wines. 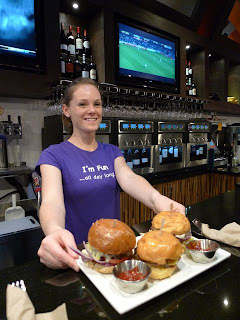 If you sit at the bar, the friendly bar tender will take your order and get your wine, while you watch the soccer game or ESPN on the flat screens behind the counter. If you sit at a table, you have to order at the counter, take a number and have the food brought out later. Pat and I ordered up three sliders: the Classic American $2.89, a plain Classic American and a Mediterranean $3.69. The price drops for each additional slider you get. For instance, for the American, one slider costs $2.89. Two are $5.29. Three will set you back $7.49 and a dozen are $28. We also ordered baked fries $1.99. They don’t have a fryer. The order got messed up in the back and took about 15 minutes to come out, but we didn’t really mind. The beer and wine were good, the young lady at the counter charming and the other customers friendly. When the sliders did arrive, the burgers were nicely arranged on the white plate. 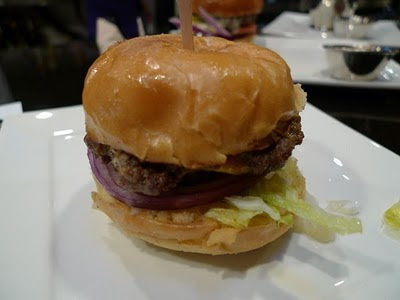 A little more than 3” in diameter, the little burgers are artfully and carefully constructed. On my American Classic, the yellow bun was squishy and fresh. The Niman Ranch all natural beef patty, was thick and nicely cooked to medium. On top was the melted American cheese. Stuffed underneath the patty were shredded lettuce, tomato, onion and a crisp pickle chip. A little mayo lubed the thing up. The burger was quite enjoyable. The Mediterranean was a combo of flavors I had not had before on a burger: garlic and ginger spiced lamb was accompanied by Bleu cheese, artichokes, tomatoes, red onions and garlic sauce. But the nicest touch were the sliced black olives, which I don’t usually like. The baked fries were surprisingly good, served up in a little silver pail. They were thin and light and not the limp soggy things I expected. Two sliders, baked fries and a beer, I could get used to hanging out at the Slider Bar Café and enjoy it. Burger 4 spatulas out of 5.